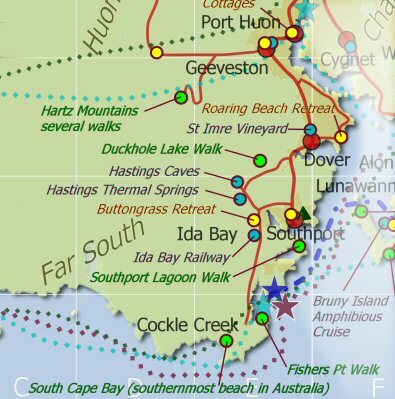 Caves, thermal springs and a cafe in Far South Tasmania, 1.5 hours south from Hobart, Australia. Enjoy a guided cave tour, barbeque, swim and gentle bush walks, before continuing on to the nearby historic railway or gemstone fossicking. 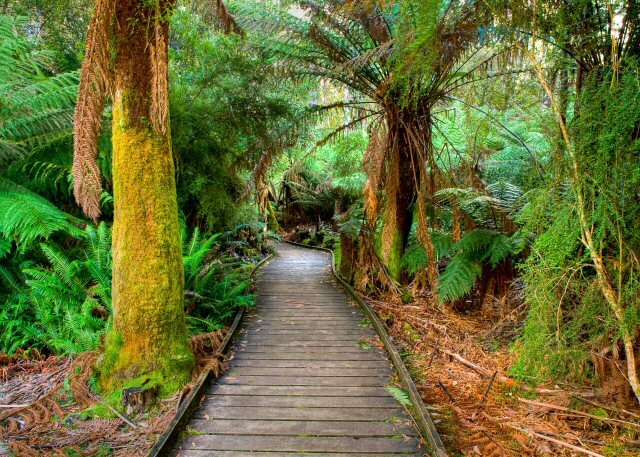 Far South Tasmania is a land of waterways, wilderness and wildlife. 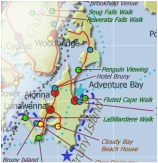 This is your one stop shop to plan and book your Far South Tasmania and Bruny Island and Huon Valley Escape. Tour magical chambers of flowstones and shawls, then relax in a thermal pool. Hastings Caves in Tasmania, includes Newdegate Cave, the largest tourism cave in Australia. The Tasmania Parks and Wildlife Service conducts 45-minute tours through Newdegate's large, highly decorated cavern. Newdegate Cave is spacious and well lit, with no narrow passages. There are around 240 stairs but these are traversed in small sections. The underground temperate is naturally maintained at nine degrees Celsius (48 degrees Fahrenheit) all year round. You can buy your tickets for the cave tour, at the Hastings Cave Visitor Centre, which is about five kilometers (three miles) from the cave entrance. Here you'll find modern, well equipped facilities including interpretation, souvenirs and a licensed cafe. The Hastings Experience: Includes Hastings Cave, Thermal Springs, walks and facilities. Two adults and three children. Please arrive at the Visitor Centre at least 30 minutes before the advertised tour time. 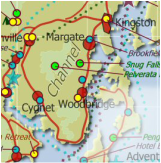 Visitor Centre and Pool Open 10 a.m. to 4 p.m.
Hastings is not currently bookable online. 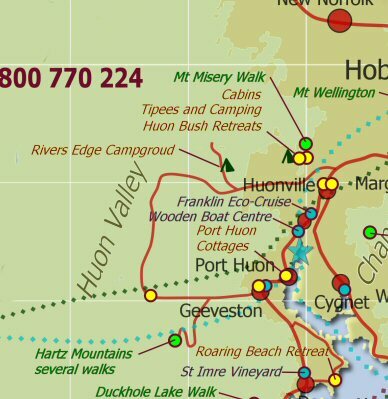 To purchase tickets as part of a Huon valley Escape Package, please use the email button below. Otherwise, arrive early and purchase your tickets at the visitor centre. The thermal pool is surrounded by forest and ferns and has a large picnic area equipped with change rooms, showers and toilets, electric barbecues, shelters and forest walks. The pool is fed from a spring that supplies spring water at around 28 degrees Celsius (82.5 degrees Fahrenheit) all year round. It is hygienically controlled and has a paddling pool for children. Hastings Caves in Tasmania, includes Newdegate Cave, the largest tourism cave in Australia. The caves of this region started to form approximately 40 million years ago and remained unseen until 1917, when timber workers discovered an entrance. They named their magnificent find after the governor of the time, Sir Francis Newdegate. Formations in the cave are spectacular and include flowstone, stalactites, columns, shawls, straws, stalagmites and the unusual helictites - tendrils of calcite that grow in all directions in tiny filaments. It is one of the few caves in Australia to have formed in dolomite, which is harder and heavier than limestone. (Dolomite is characterised by pearly white and pinkish crystal, and should not be confused with that famous Tasmanian rock, dolerite, which weathers into tall grey flutes such as those you see on Mt Wellington and Cradle Mountain). The underground temperate is naturally maintained at nine degrees Celsius (48 degrees Fahrenheit) all year round. 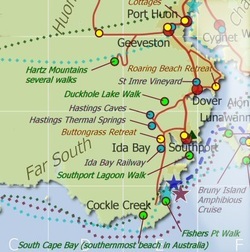 Southwest National Park, The Southern Ocean, fishing villages and the furthest south point in Australia. 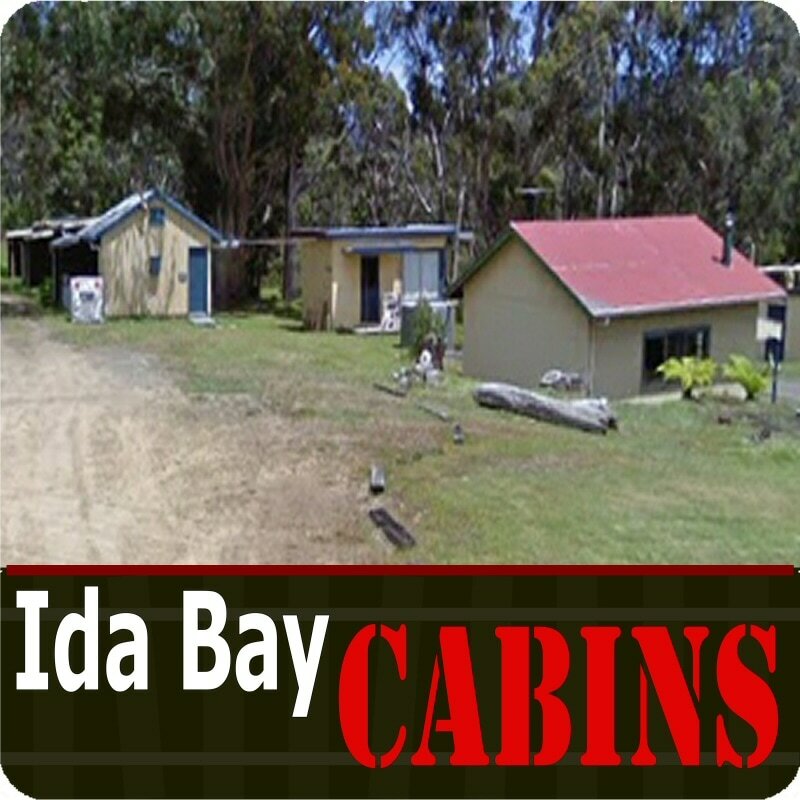 Buttongrass Retreat is the perfect place to stay near Hastings Caves. Comfortable 2 bedroom, self contained, eco-cabin, just 10 minutes drive from Hastings Visitor Centre. 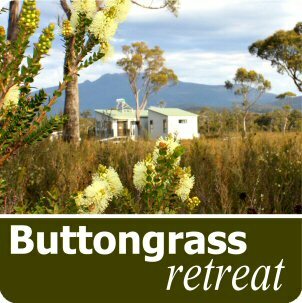 Book 2 nights at Buttongrass Retreat, Sunday to Thursday at the normal two night rate and receive one free Hastings Experience ticket. You must ask for the offer at time of booking. Budget studio self contained cabin or bunkrooms with shared facilities.